The new Hyundai Tucson signifies a major turn in direction for this carmaker with a compact SUV that’s not only bold in its design but which also has some impressive technology on board. Hyundai has been spurred on after selling more than 1 million SUVs in Europe and they believe there’s a market for the Tucson. The interior has been well-designed with impressive use of cabin space and ergonomics play a big part in making this a comfortable driving experience. Like the firm’s other offerings, the Hyundai Tucson will come with an impressive five year warranty and the firm is also throwing in a seven-year free subscription to TomTom satnav services. However, this isn’t just a rebadged SUV for the European market; Hyundai stresses it has gone to great lengths to ensure that the car meets European expectations. To that end the chassis has been re-engineered to deliver a more focused ride on European roads and with improved driving dynamics. The Hyundai Tucson is also built in Europe and buyers have a range of engines to choose from with a variety of power outputs from 150PS to 186PS. The new chassis lends itself to being an excellent platform that creates lots of space, in addition to clever designing, and there’s a useful 513litres of boot space. Standard kit includes things like a powered tailgate, keyless entry, electric parking brake and a smart parking assist system to help parallel-park the vehicle. In the dashboard is an eight-inch display screen which is home to the new generation satnav system (it’s three times faster than the version fitted previously in Hyundai vehicles). However, many buyers will be impressed with the list of technologies on board which include an emergency braking system which operates when it detects an obstacle in its path. There’s also lane keeping assist, and a cross traffic alert system which monitors the area behind the Hyundai Tucson for any approaching traffic. In addition to developing the new chassis, Hyundai’s designers have also paid attention to the steering to help ensure it meets with European expectations and needs. Engineers have also designed the vehicle to be a comfortable ride without sacrificing driving dynamics so they’ve introduced new dampers and suspension to help deliver what they hope will be a successful package. 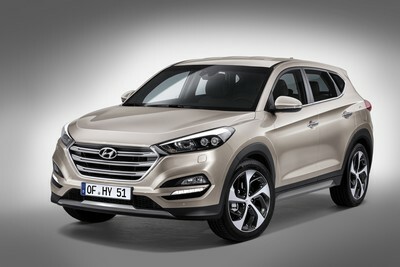 The Hyundai Tucson made its debut at the Geneva motor show and will be appearing in our showrooms later this year. Prices and UK spec will be revealed nearer to its availability. This entry was posted in Car Leasing, Car Updates & Releases, Cars, Crossover Cars, New Cars and tagged hyundai, hyundai tucson by Steve Lumley. Bookmark the permalink.